An artist&apos;s conception of a merger of two neutron stars. CAMBRIDGE — Comparing it to the moment Hollywood added sound to silent movies, scientists Monday revealed they had successfully paired the “ears” of the new gravitational-wave observatories born at MIT with the “eyes” of more traditional telescopes to jointly capture evidence of a violent, distant cataclysm for the first time. 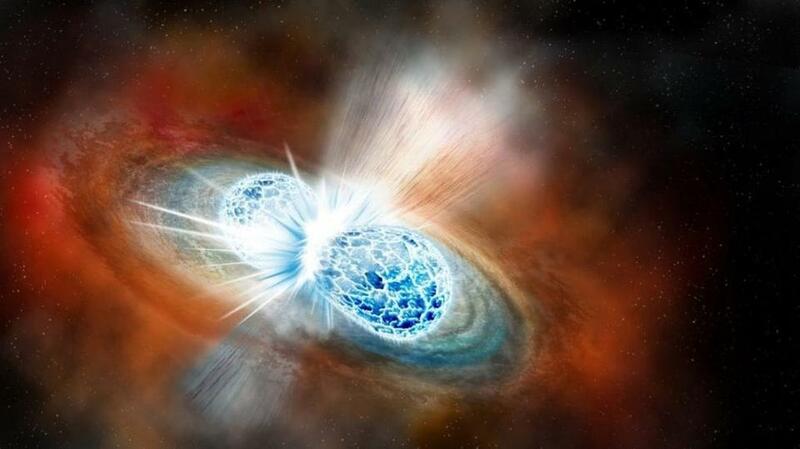 All at once, the finding provided the first definitive visual evidence of the dramatic collision of two neutron stars, ending with a burst of cosmic fireworks known as a kilonova, and afforded a clear answer for how gold, platinum, and other precious metals and heavy elements were first formed, blast-forged in the thermonuclear furnace of such a cataclysm. At the same time, it provides clues about how often neutron stars pair off in these explosive death-dances and about the expansion rate of the universe, while heralding many more coordinated detections to come — offering so many immediate and long-term rewards that researchers struggled to pick their favorite part. “It’s like getting a kid in the candy store and telling them to choose. Can you choose?” said MIT research scientist Erik Katsavounidis, imagining tantalizing candy bins marked cosmology, nuclear physics, precious metals, and more. He predicted “kilonova” in the near future would make the leap from science into the wider lexicon, as the supernova did before it. And he compared this coordinated discovery to admiring Van Gogh’s famed “Starry Night,” with its moon and 11 “squiggly stars,” in solitude — before a 12th star bursts suddenly onto the canvas, accompanied by the unmistakable glissando that launches Gershwin’s “Rhapsody in Blue,” with Benny Goodman on clarinet. Rainer Weiss also received a pair of degrees from the Cambridge university. Katsavounidis was hardly the only scientist to wax rhapsodic at live-streamed press conferences held Monday at MIT, the National Science Foundation in Washington, and elsewhere. He is a member of the two-observatory, thousand-researcher global effort rooted at MIT and Caltech and known collectively as LIGO (short for Laser Interferometer Gravitational-wave Observatory). David Reitze, a Caltech-based physicist who serves as LIGO’s executive director, displayed a pocket watch that had belonged to his grandfather. “The gold in this watch was very likely produced in the collision of two neutron stars approximately billions of years ago,” he said. The latest discovery, published Monday in the first of a series of journal articles, involved a few thousand more researchers than even the existing LIGO gravitational-waves collaboration, as teams affiliated with scores of government- and university-backed observatories literally around the world joined the search — 70 telescopes on seven continents and in space. 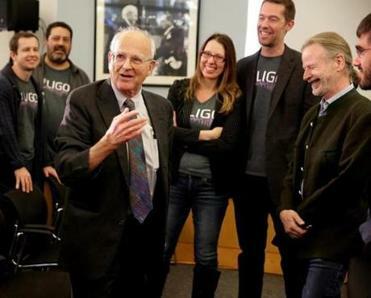 None of it would have been possible without the LIGO detectors first envisioned by MIT physicist Rainer Weiss 50 years ago as a classroom exercise during his sole semester teaching relativity and refined in an initially obscure 1972 paper. Weiss, an emeritus professor who still works six days a week at 85, won the Nobel Prize for Physics two weeks ago, along with two longtime Caltech collaborators who saw the potential in his idea and helped make it real, as a set of massive observatories in Louisiana and Washington and that vast scientific network. Weiss had theorized that high-powered lasers, miles-long vacuum tubes, and near-flawless mirrors could hold the key to detecting gravitational waves, ripples in the fabric of space and time that Albert Einstein established a century ago in rewriting our understanding of gravity. But even Einstein died doubting these waves — cast off by accelerating bodies with mass, like colliding linemen or twin stars spiraling each other — could ever be detected in real life. Even strong ones stretch and squeeze the rigid dimensions of space-time by just the width of a human hair across trillions of miles, while moving at the speed of light. Which is why LIGO’s February 2016 announcement that it had successfully recorded gravitational waves from two colliding black holes — never before known to exist in pairs — more than a billion light-years away made a splash in science and popular culture, too. If that seemed the culmination of a decades-long quest, it was actually the beginning of a new era of gravitational-wave astronomy. And though black holes have such intense gravity that no visible light or other electromagnetic radiation can escape for detection, the LIGO team believed it was only a matter of time before their detectors captured a signal from something that has a visible counterpart. They imagined that could come from the collision of two neutron stars, once-vast stars that have exploded as supernovae, leaving collapsed cores so mind-bogglingly dense with neutrons that they cram the mass of our own sun into something that could fit inside Route 128. Scientists discovered the first neutron star in the 1960s — because they emit radio pulses while spinning, like a lighthouse — and found the first pair in the 1970s. They predicted that each pair would spiral closer together before scraping and merging violently, with that final merger causing a fireball of gamma rays to eject, followed by a longer trail of light and other radiation, as unstable isotopes formed suddenly from that collision decay into more stable elements and hurtle across space. But definitively catching that brief, explosive finale to a billions-of-years-long dance is a different matter. “It’s the classical challenge of finding a needle in the haystack, with the added challenge that the needle is fading away and the haystack is moving,” said Marcelle Soares-Santos, a Brandeis physicist who helped design the 570-megapixel camera mounted on the Blanco Telescope at the Inter-American Observatory in Chile. Ordinarily, that super-powered camera takes frame-by-frame shots of the night sky for something called the Dark Energy Survey, so cosmologists can study the expansion of the universe. But it is also part of the on-notice telescope network that sprang into action Aug. 17, amid a flurry of e-mails, texts, and automation. 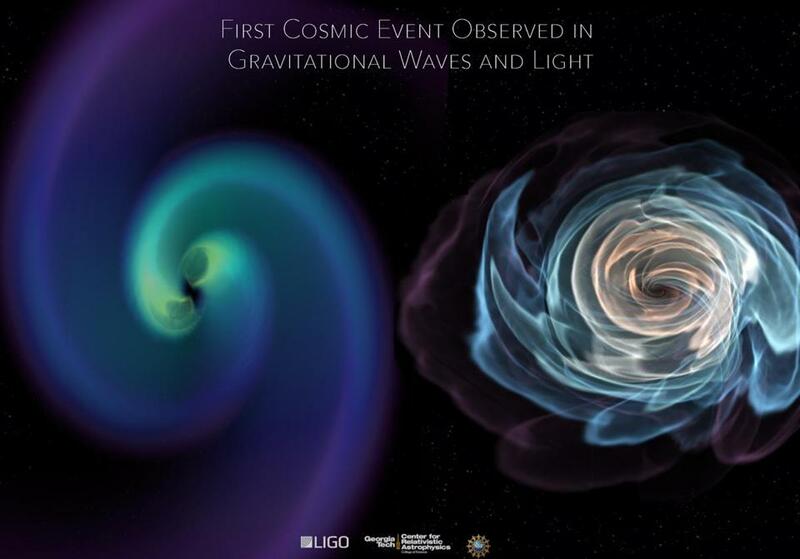 The frenzy began at 8:41 a.m. Eastern time when LIGO picked up a minute-long signal — a waveform that could be played as a long chirp that rose suddenly at the end and that was emitted during the final, dramatic minute of spinning and colliding by two massive objects. Traveling at light-speed, that gravitational-wave message needed 130 million years to reach Earth. Two seconds later, NASA’s Fermi Gamma-ray Space Telescope, orbiting above Earth, detected a two-second burst of gamma rays, the highest-energy form of electromagnetic radiation. That telescope detects such flashes hundreds of times a year, from sources as varied as earth-bound thunderstorms, flares from our own sun, and flashes across the universe, Fermi scientist Julie McEnery said. 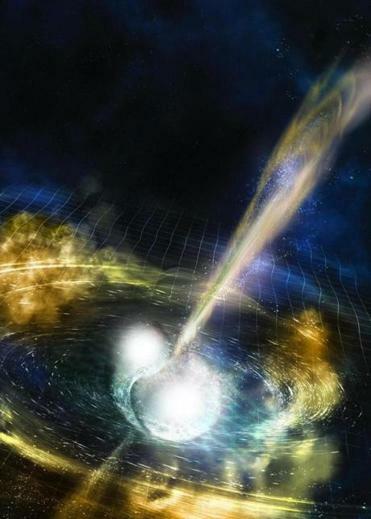 This was no coincidence, computers determined within minutes, identifying the two signals as coordinated messages from the merging of two neutron stars. Fermi quickly produced a “sky map” where the gamma rays had originated covering a vast area, roughly 1,500 square degrees, bigger than a large constellation. But the two LIGO detectors — aided by a third LIGO-inspired observatory known as Virgo in Europe that had just been activated a few weeks before — were able to triangulate a much smaller area. Overlaid with the Fermi map, it yielded an area of about 30 square degrees, the size of 150 full moons on the night sky. Knowing, too, that the signals traveled 130 million light-years, the combination told telescopes not just where to point and zoom but how far off to focus, Katsavounidis said. Soon, one team then another found it through naked-eye comparisons of before and after images of the sky and through computer analysis. Over the next two weeks, they traced the color-changing kilonova trail not just in the visible-light band but across the electromagnetic spectrum, using X-ray, radio, infrared, and other kinds of telescopes — yielding reams of data about a collision that produced a burst of heavy elements equal to 16,000 times the mass of Earth, including 10 times its mass in gold and platinum alone, said Edo Berger, a Harvard astronomer.